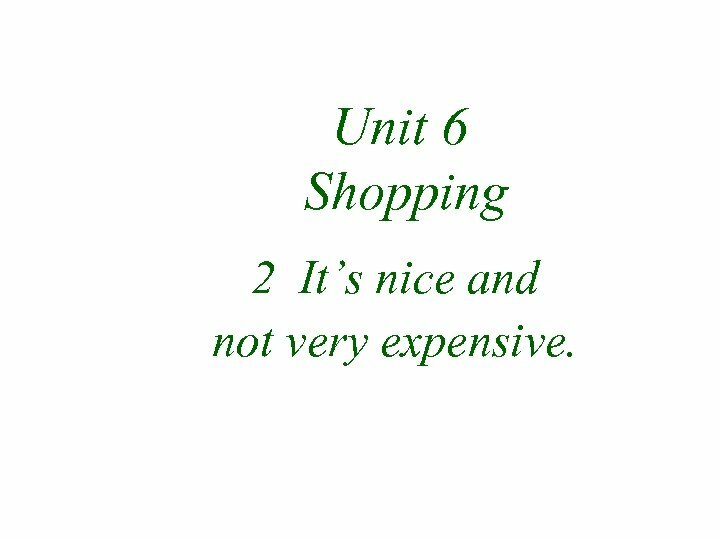 Unit 6 Shopping 2 It’s nice and not very expensive. 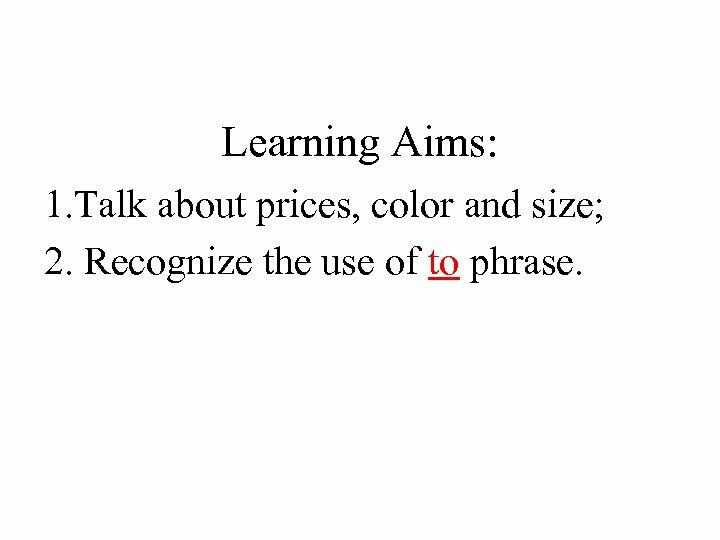 Learning Aims: 1. Talk about prices, color and size; 2. Recognize the use of to phrase. Listen and answer Shop assistant: What can I do for you, sir? Tom: I’d like some traditional Chinese things. 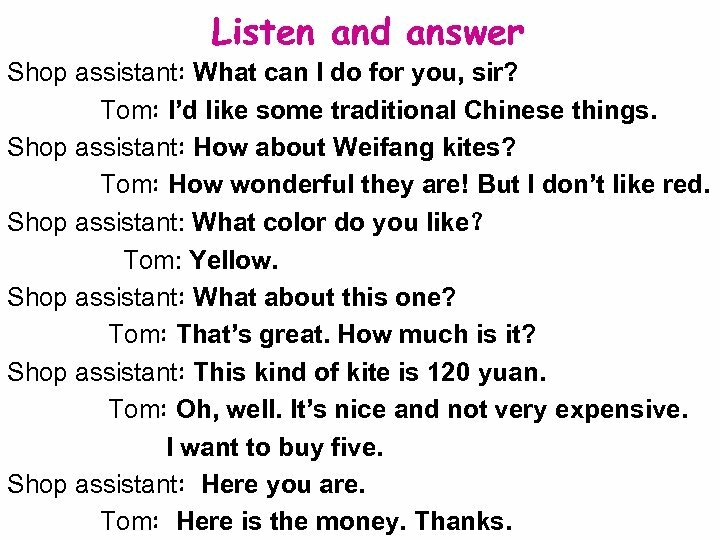 Shop assistant: How about Weifang kites? Tom: How wonderful they are! But I don’t like red. Shop assistant: What color do you like？ Tom: Yellow. Shop assistant: What about this one? Tom: That’s great. How much is it? Shop assistant: This kind of kite is 120 yuan. Tom: Oh, well. It’s nice and not very expensive. I want to buy five. Shop assistant: Here you are. Tom: Here is the money. Thanks. Q: 1. 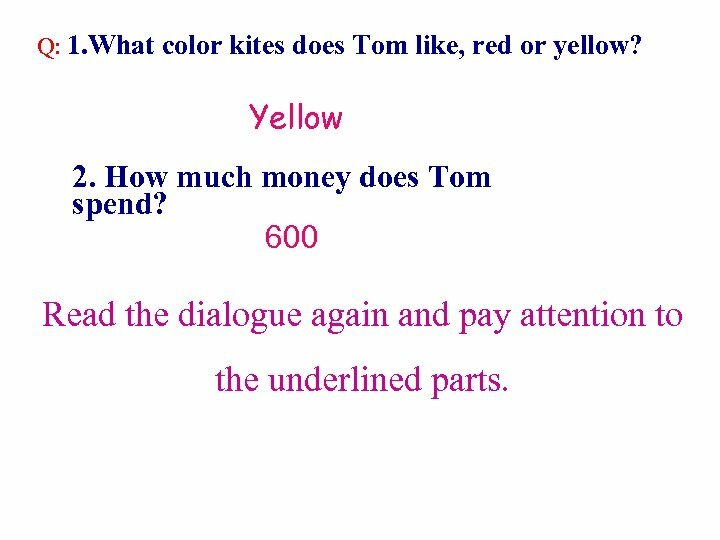 What color kites does Tom like, red or yellow? Yellow 2. How much money does Tom spend? 600 Read the dialogue again and pay attention to the underlined parts. S: What can I do for you, sir? T: I’d like some traditional Chinese things. 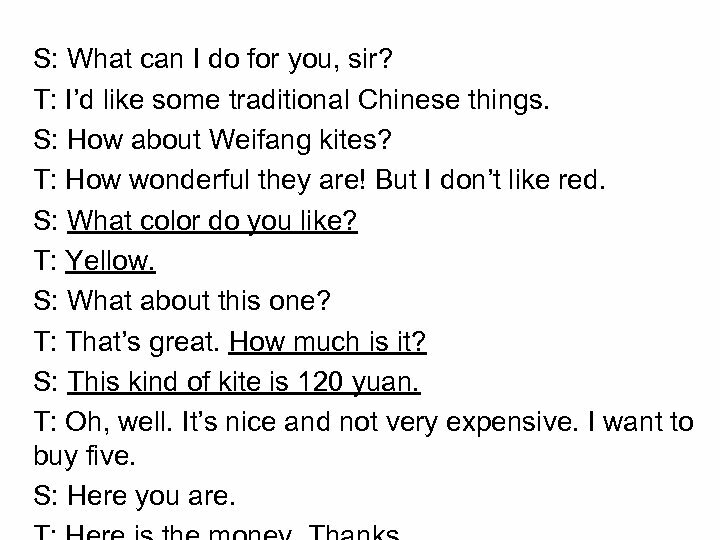 S: How about Weifang kites? T: How wonderful they are! But I don’t like red. S: What color do you like? T: Yellow. S: What about this one? T: That’s great. How much is it? S: This kind of kite is 120 yuan. T: Oh, well. It’s nice and not very expensive. I want to buy five. S: Here you are. 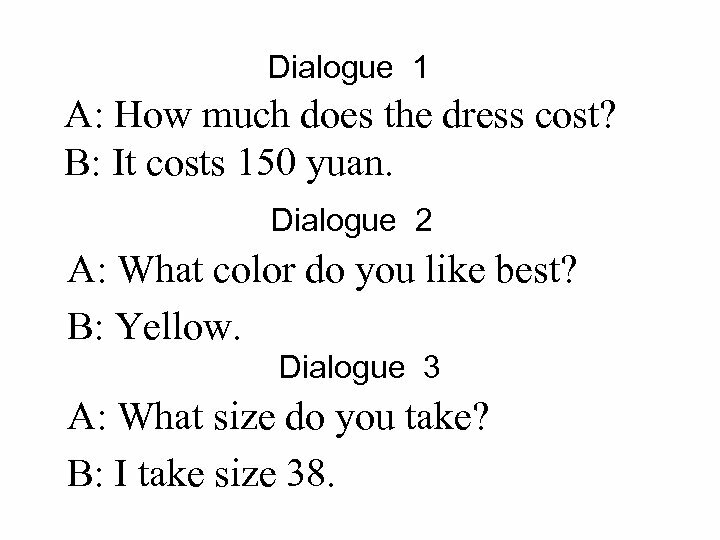 Dialogue 1 A: How much does the dress cost? B: It costs 150 yuan. Dialogue 2 A: What color do you like best? B: Yellow. Dialogue 3 A: What size do you take? B: I take size 38. 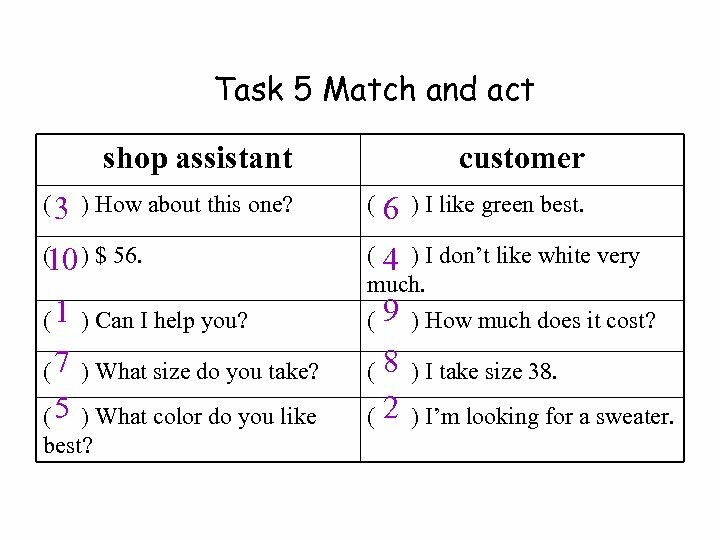 Task 5 Match and act shop assistant customer ( 3 ) How about this one? ( ( ) $ 56. 10 ( 4 ) I don’t like white very much. ( 1 ) Can I help you? ( 7 ) What size do you take? ( 5 ) What color do you like best? ( 6 9 8 (2 ( ) I like green best. ) How much does it cost? ) I take size 38. ) I’m looking for a sweater.